Peninsula Palms consists of both Independent Living Units (ILU’s) and a Residential Care Facility situated at Rothwell on the Redcliffe Peninsula and is administered by Mueller Community Church. We have 103, one, two and three bedroom Independent Living Units (ILU’s). Our Care Facility has 65 beds, made up of nine couples “apartments”, 50 single ensuited rooms and 6 rooms with a bathroom shared between two. Peninsula Palms is co-located with Mueller College (over 1300 students), a Child Care Centre, Bible College and Mueller Community Church. Our campus has a home like environment, offering comfort, safety and well being to our Residents. The village has a pleasant outlook over beautiful bays and is favoured with the sunny, balmy climate of South-East Queensland. Approximately 30km from Brisbane City and ideally situated between the popular Sunshine and Gold Coasts. There are ample opportunities for fishing, boating, local beaches and visiting the islands of Moreton Bay. 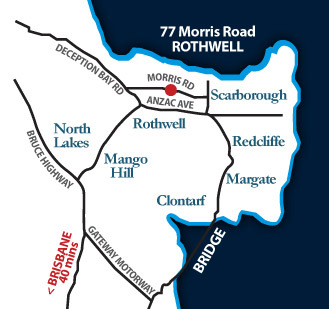 Based on the Redcliffe Peninsula, we are only 30km from Brisbane CBD and a short drive to the Sunshine Coast.